next letter in the alphabet! To be fair the architecture of our farmhouse here in Devon is not, strictly speaking, all that amazing (although I personally think it is pretty awesome.) The house is not listed but we think it was built circa 1769/1770. However, when we had the extension extended our architect, who specialises in old Devon buildings, confirmed that would be the likely date judging by the style of various architectural features. The window and front door lintels intrigued our architect. I had noticed, but he pointed out that they are all different! Note the mortar in the walls - the front of the house has been re-done in horrible cement which will have to be replaced one day, but the original back wall (now inside the extension kitchen) has original limestone and shell mortar. The Dairy is an anomaly as well. The shape of the dairy is old – look at the pitch of that roof. From a distance it looks every inch like an old Devon Cobb building. Cobb is made from mixing mud, straw and water together then set layer upon layer to build a wall, left to dry – hey presto a solid structure. Our dairy is modern (ish) breeze block though. I think someone in the past has gradually rebuilt the dairy in the same style, replacing the old cobb with new breezeblocks as the walls have worn away. The new extension has been beautifully done – fitting on to the old house as if it has always been there. I particularly love the dormer windows – they make the whole new part look old. Plus we paid that little bit extra to install a solid oak staircase. My only miff, it is American Oak not English Oak. Apparently the USA has plenty to spare, we don't. Great post - and what a lovely home you have. Looking forward to your next post. Thank you Alison - I love it here in Devon, so very different to when we lived in London! Oh how exciting! It's proving a bit time-consuming, but great fun! I love old buildings and all their history. Your house looks amazing. I think I've guessed K but I won't spoil your surprise. I'll just pop back to see if I'm right! I can appreciate the beauty you have there. Most enjoyable to read and the pictures are awesome. A good start to the challenge. Thanks - been a bit of a hectic day, but I've had fun! Lovely home. My father's family owns a farm near Quebec city, this reminds me of it. Love your owl collection too! Actually living in a building that's two and half centuries old, how amazing is that?! Loved the lintels, so much character. 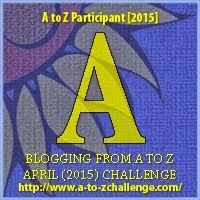 You have a beautiful home, and a great entry post to the A-Z. Thanks. I still can't really believe that I am living in such a wonderful place, even though we are into our third year here now! What a beautiful home you have, I do love a bit of architecture! I know absolutely nothing about architecture, but old beams and walls do somewhat inspire you to learn! Thanks for leaving a comment. A relative of mine lives in an old Devon farmhouse, and I've been caught out on his wonky floors several times! Your stone walls are beautiful. The only time the floor got a bit disconcerting was when I had an ear infection which affected my balance - it was a bit like trying to walk along the deck of a swaying ship! LOL. THanks for dropping by my blog! I love old architecture! My wife and I will wander for hours taking pictures and enjoying the countryside. Your place is beautiful. Thanks for sharing with us! I really want to tour England, Ireland, Wales, and Scotland some day since my 7th removed great grandfather came from somewhere over there. We think Wales, but not 100% sure..
With a surname of Griffith (Welsh would be variations of Gryffiydd) I'd say you have Welsh connections somewhere! Love your new life with a view! I have a fondness for old structures and the stories they tell. I wonder though if it's hard to heat in the winter. Probably the least of your concerns but was just wondering. That stone looks cold. Nice start to the a-z!! The good thing about stone is that it holds the heat, so once the fire is going in what is now the sitting room (it was once the kitchen) the whole of the old part of the house is kept warm. In the summer when its hot it is lovely and cool inside. We've had several high winds lately (there's a gale blowing outside as I write this) but the stone's so thick you can hardly hear it! Come back for W and I'll tell you more! I'd love to live in an old house. My current one was built in 1965. Ugh. When we were given the chance to move we set out to find an old place. I wanted somewhere with a past. We did look at a four year old house - beautifully built but it had no soul to it! This one hugs you as you come in through the door. Hello Ms Helen. I found you at no 596. Your house looks very nice. Your grass looks even nicer. Can we come and mow it for you? Your home has a lot of character. Ours is only nine years old! Is K "keystone"? 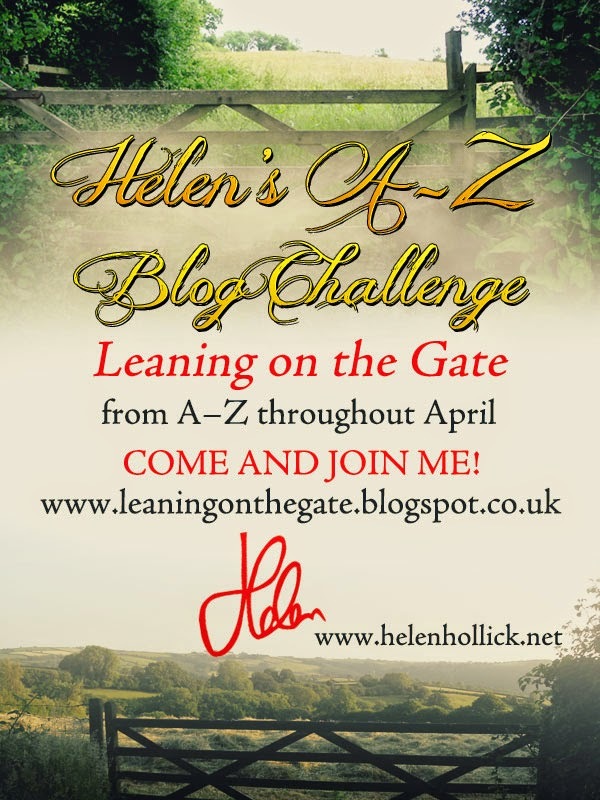 Visiting from A to Z, your Devon farm is fascinating. I especially enjoyed the idea of the dairy being an old cob building. I'll be back. Thanks Ann for leaving a comment and for the promise to come back! Thank you for visiting my blog. A few days ago, I was in Charleston, South Carolina and visited a former plantation house called Drayton Hall that dated from the 1700's. That house, sadly, was built with slave labor. Some of the brick work you show reminded me of what I saw, though. The brick work would have been very similar, yes. I've heard of Drayton Hall - I'm coming to North Carolina in the summer, bit too far to see Drayton Hall though. Charleston, of course does have a connection with my pirate-based adventure novels, for Blackbeard held it under siege for several days and kidnapped the Governor's son. The ransom wasn't money though, but much needed medical supplies. I'm speechless. It's like a movie set, and completely UNLIKE anywhere I've ever lived. Thanks for sharing. It's completely unlike where I used to live as well! LOL. I absolutely love this house - and Devon! I love old structures! Great start to the A to Z. Your house is amazing! It is great that old, historical houses are preserved and renovated to still retain its original form and shape. Here in Cambodia, there are a lot of French-Cambodian style colonial houses and buildings that are being torn down to give way to commercial and residential buildings (they are ugly, IMO) - which results to the loss of national heritage treasures. I enjoyed reading your post. And thanks for visiting mine earlier. Thank you - apologies for the delay in replying to you! I think it's absolutely amazing! What a beautiful home! What a beautiful home. Thanks for sharing it! Thanks Marcy for dropping by and leaving a comment on my blog! Love this!!! Thanks for the glimpse of your beautiful home! Thanks Stephanie - all visitors welcome, especially 'virtual' ones!